This is a great art view of outdoor decoration. The picture displays the 48" giant chess of Bishop head part. Bishop is one of chess pieces. It has come with brown colors, or natural wood color. 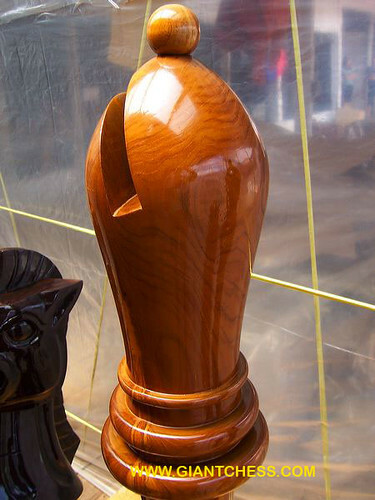 Made from best quality of Teak wood and carved by our professional craftsman. It also has polished n good result and add with glossy touch. Looks giant and gallant. Adorable! Giant Chess in public garden gives different atmosphere of joy and togetherness. It is a good outdoor decoration that can be enjoyed by many people from all ages. This giant chess has aimed for outdoor chess game. But you can use it for house decoration, both for indoor and outdoor. Have it now!